IRI Islamic Regime Got to Go! Are you ready to stand up for Iran and dump Islam? Are you sick of the Islamic Regime of Iran yet? Over 3 decades of Islamic oppression in Iran, is it enough? I smell the winds of change, do you? It is time to get tough on IRI dreadful Islamic Regime. About time a US President is standing up to the Terrorist Regime of Tehran. Trump begins his administration by slapping IRI in the face. We welcome this great stand of the Trump Administration versus Obama’s appeasement of IRI and betrayal of the Iranian Opposition. Iranian Opposition has been with Trump since the beginning and will fight alongside Trump with the IRI all the way to the bitter end. Iranian Opposition seeks the termination of IRI and an end to the Islamic Regime. We welcome any move against the IRI no matter how small or insignificant. Our goal is the demise of IRI and any government or persons aiding us towards this great goal are welcomed by us. Soon or late the Islamic Regime of Iran needs to be eliminated, along with it the IRI Lobby in USA. We seek the establishment of the government of law in Iran. Islam and the Islamic Regime fights against the freedom, secularism, democracy and human rights in Iran! Re: IRI Islamic Regime Got to Go! 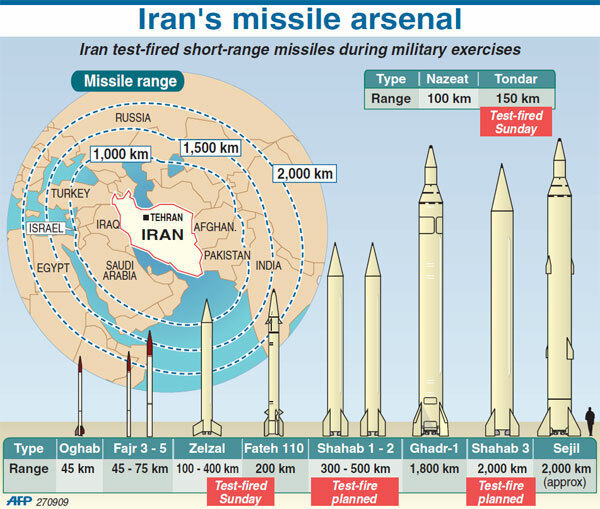 We maybe ready but Iranians are still sleep! Text reads: Lately they (USA) have made a commotion about the IRI Missile capabilities but they should know that they cannot do Jack Shiite! 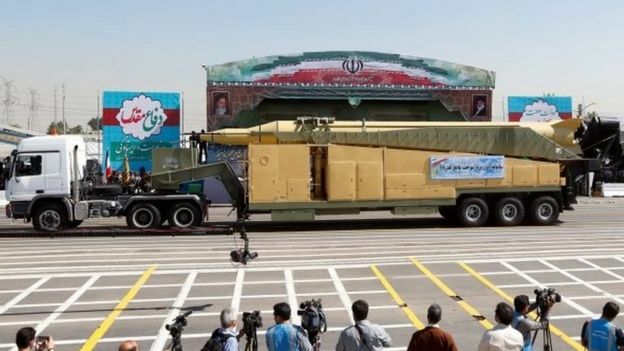 IRI displayed their new nuclear capable ballistic missiles. IRI needs to keep it up. Keep on arming, making nuke capable missiles, aggression in Middle East, funding terrorists, and taunting Trump. Something got to give. Soon or late it will be revolution or war and Iranian Opposition welcomes both. Overthrow of the Islamic Regime of Mullahs by all means possible is our desire. Secularism, Federalism, Human Rights and Democracy in Iran. President Trump speaks on Iran policy from the Diplomatic Reception Room of the White House on Oct. 13, 2017. 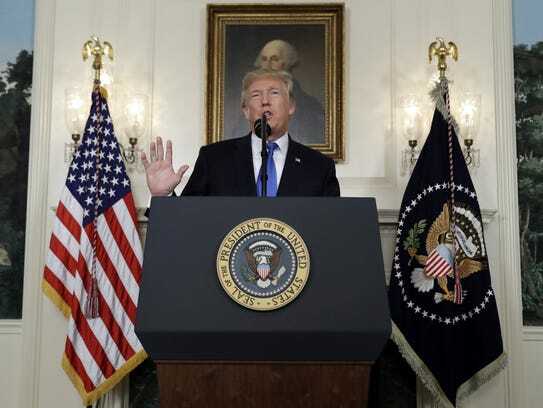 WASHINGTON — President Trump unveiled a sweeping and aggressive new policy toward Iran on Friday, saying he will not re-certify the nuclear deal signed in 2015 and calling for a variety of new sanctions against the government in Tehran. "The Iran deal is one of the worst and one-sided transactions the United States has ever entered into," Trump said during a speech at the White House. Saying the Islamic government in Tehran is dedicated to "death, destruction, and chaos all around the globe," Trump announced that the United States is starting sanctions against Iran's Revolutionary Guard, which he called a supporter of international terror. The president also said he has started an investigation into whether Iran is cooperating with North Korea's nuclear weapons program. But while Trump formally announced his decision to begin backing out of the multinational agreement, he also did not ask Congress to re-impose economic sanctions right away; instead, he called for new requirements on Iran in an effort to "strengthen enforcement" of the agreement he has long criticized. “In the event we are not able to reach a solution working with Congress and our allies, then the agreement will be terminated," Trump said. The new approach to the nuclear agreement is part of an overall strategy to deal with the Iranian "dictatorship," Trump said. The president repeatedly criticized Iranian aggression, from the 1979 takeover of the U.S. embassy in Tehran to repeated threats against the United States and Israel. He also accused them of seeking to evade the requirements of the nuclear deal, even though officials in the Trump administration and other countries say Iran has been in at least technical compliance. Trump faced a Sunday deadline to certify the agreement. Every 90 days, the president must certify that Iran is in compliance of the deal. The president decertified the agreement despite statements by Secretary of State Rex Tillerson and other officials that Iran has "technically" held up its end of the bargain. In outlining Trump's new approach to Iran, Tillerson told reporters that the goal is to strengthen the deal: "Let's see if we can address the deficiencies that exist within this agreement." Tillerson added that "we may be unsuccessful," and "we may not be able to fix the deal." He added that Trump himself is "not particularly optimistic" about the prospect. The U.S. signed the agreement in 2015 along with Russia, China, Germany, France and Great Britain. The European signatories have urged Trump to re-certify it and questioned whether Iran would go along with any new provisions. Under the agreement, the U.S. and allies reduce sanctions on Iran in exchange for Tehran giving up its nuclear weapons program. 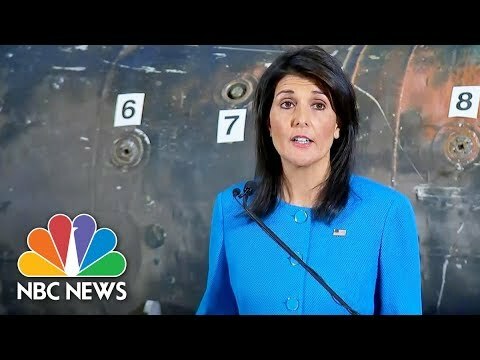 Iranian President Hassan Rouhani, who says Iran's nuclear program has always been designed for peaceful energy purposes, has said that the U.S. walking away would damage international trust of the U.S.
"Every word was analyzed many times by countries involved before its ratification," Rouhani told NBC News in September, "so if the United States were to not adhere to the commitments and trample upon this agreement, this will mean that it will carry with it the lack of subsequent trust from countries towards the United States." 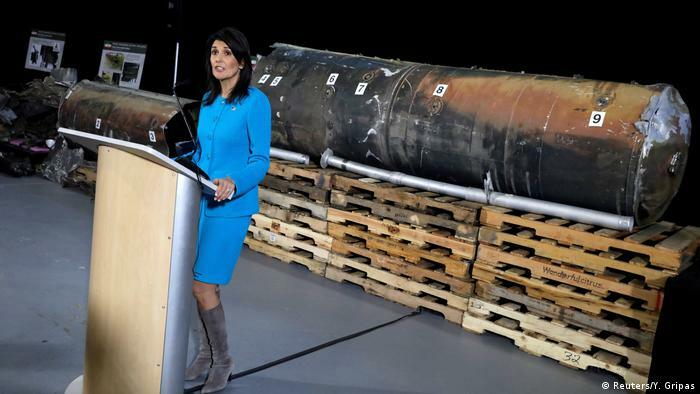 And allies fear that killing the agreement could prompt Iran to resume its nuclear weapons program, perhaps triggering a nuclear arms race throughout the Middle East. Trump aides said their approach to the Iran nuclear deal is part of an overall strategy designed to confront the Tehran government over what they call its bad behavior, including support for terrorism and efforts to destabilize other countries. As part of that strategy, Trump announced news sanctions on Iran’s Islamic Revolutionary Guard Corps, describing it as a special "terror force." While the nuclear agreement is flawed in the administration's view, Tillerson said it is "only one part of what concerns us" about Iran. De-certification would not kill the deal outright; that would be up to Congress. Lawmakers have three options, Tillerson said: Do nothing and refuse to slap new sanctions on Iran, thereby keeping the existing deal alive; re-impose economic sanctions, effectively killing the agreement; or push for new negotiations for additions that Trump believes will "put more teeth" in the demands on Iran. One possible provision would be adding "trigger points," new rules that would lead to an immediate re-imposition of sanctions if Iran violates them. 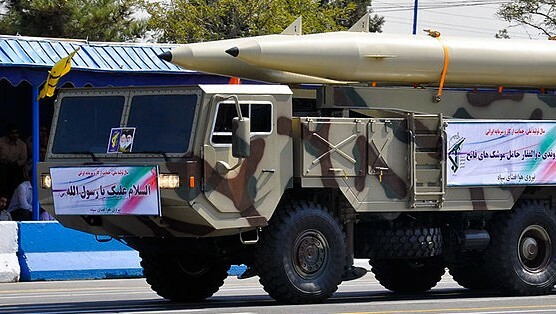 One example, Tillerson said, would be development of prohibited ballistic missiles. Some U.S. officials also want to eliminate "sunset provisions" in the existing agreement, which allow Iran to resume its nuclear program after a decade or more. It is not clear whether U.S. allies or Iran would be willing to engage in new talks, much less a new agreement. Trump has signaled his de-certification move for months, siding with critics who say the 2015 agreement gives Iran too much room to cheat, even as they profit from the elimination of economic sanctions. "I think it was one of the most incompetently drawn deals I've ever seen," Trump told Sean Hannity in an interview taped Wednesday. "We got nothing, we got nothing. They got a path to nuclear weapons very quickly." 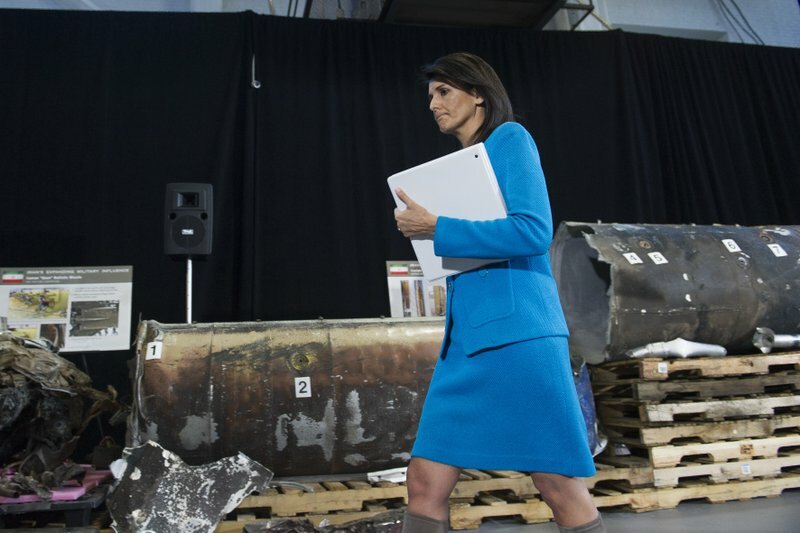 Despite similar attacks on the agreement, Trump has agreed to re-certify twice already this year, drawing criticism from some supporters who are also suspicious of Iran's intentions. Tillerson pointed out that Trump, while attacking the agreement, has also said he would be willing to see it strengthened. In his speech on Friday, Trump called on Congress to change the law requiring him to make a certification statement to Congress every 90 days. 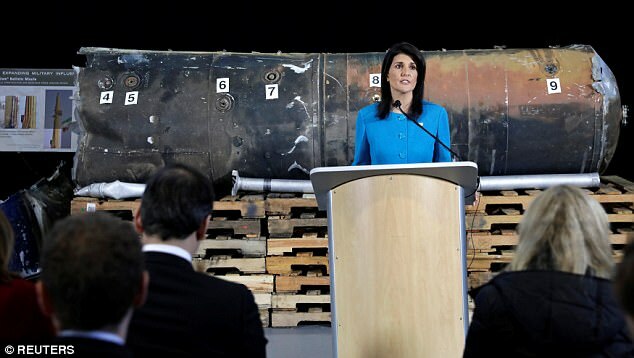 White House spokeswoman Sarah Sanders said it is only one part of an overall strategy "to deal with all of the problems of Iran being a bad actor." 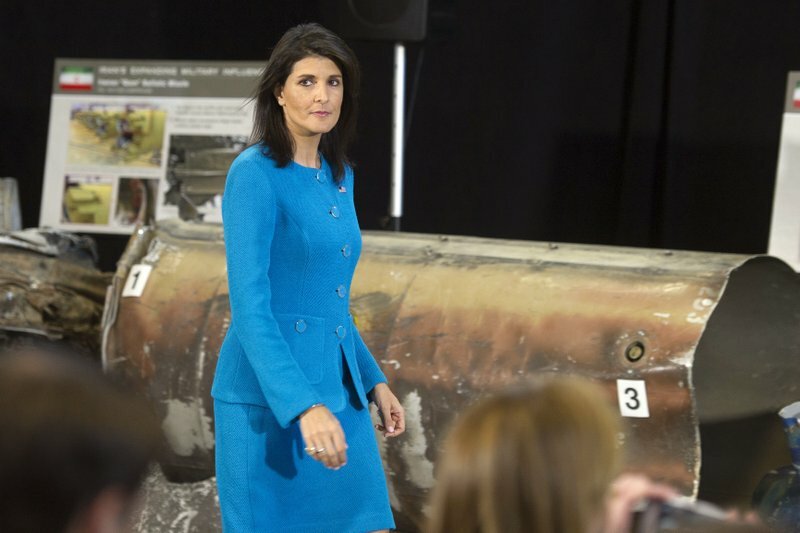 Since before taking office in January, Trump and his aides have criticized Iran's ballistic missile program, as well as what they call its support for terrorism and efforts to de-stabilize other Middle Eastern countries, including Iraq, Yemen, and Syria. They have also cited Iranian threats toward Israel, a notably vocal opponent of the nuclear agreement. Supporters note that inspection organizations have said Iran is in compliance with the demands of the existing agreement. Trump and aides have said that Iran may be living up to the letter of the agreement — "we don't dispute that they are under technical compliance," Tillerson said — but argued that the deal overall is flawed and Iran's de-stabilizing activity in the region undermines the spirit of the agreement. Trump could basically kill the deal on his own. Under the language of the agreement, the president is periodically required to waive sanctions that technically remain on the books; Trump could refuse the waiver and essentially reimpose the penalties. While Trump said his new Iraq policy is the product of a nine month review, some foreign policy analysts said comments by Trump and his team generated anxiety among allies, lawmakers, and Iranian leaders, but the plan hasn't changed much; the nuclear deal remains in effect and there's no sign Congress and Iran are willing to change it. "The entire process he just put us through did great damage," said Ilna Goldenberg, Middle East Security Director with the Center for a New American Security. "He shook pretty much everybody's confidence." Goldenberg, who worked on Iran issues at the Pentagon during the Obama administration, said Trump and his team "basically managed to alienate everyone, without really accomplishing anything." Tillerson and National Security Adviser H.R. McMaster said they have discussed their new Iran approach with members of Congress. While a new agreement may not be possible, they said some lawmakers have been receptive, and improving the agreement is worth a try in any case. Said McMaster: "Nobody's for Iran getting nuclear weapons." IRI – Saudi War is Great for Humanity! Soon or late IRI regional adventures and hegemonial ambitions will begin a regional war and possibly a global war which will in the long run end the lifespan of the regime. Throughout the history many dictatorships with conquest ambitions started big and end up dying. IRI is another example amongst the many dictatorial regimes with imperialistic ambitions. 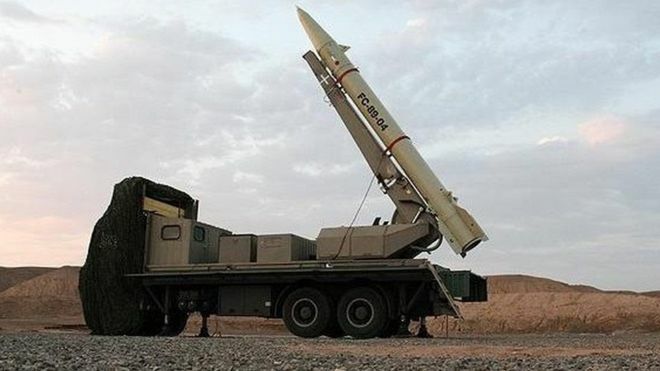 Yemenis Houthis shooting rockets at the Saudi capital and Lebanese Hezbollah creating regional sparks are only the latest two agitations and attempts by IRI to start the fire in Middle East. Soon or late IRI will begin the end of its regime. Let the Saudi Regime and Sunnis duke it out with the IRI Regime and Shiites. Let them kill each other. This war means less Muslims around the globe which is beneficial for human civilization. Less rabid animals are better for humanity. We welcome the death of IRI, Islam and the Islamism in Iran. Please go to the following link and listen to all the 60-parts of the YouTube series about the memoirs of Jafar-e Shafiezaadeh. The audio contents are 100% truth about the events of 22 Bahman 57, foreign powers directed plot and Disaster in Iran. Last edited by Surenareal on Tue Dec 26, 2017 12:30 pm, edited 1 time in total. Daughter of Larijani brings orders and daily agenda from British Intelligent Agency MI6 for the Dictator Mullah Ali Khamenei, his son Mojtaba and his mafia regime of foreign agent Mullahs occupying Iran today; and not the other way around. Last edited by Surenareal on Tue Dec 26, 2017 12:29 pm, edited 1 time in total. Please listen to this new revelation about the disaster of 1979, (Faajeh 57), a plot by the foreign powers to change the government of the Shah of Iran in 1979. Last edited by Surenareal on Wed Dec 27, 2017 6:09 pm, edited 7 times in total. The people of Iran should organize themselves - in the absence of Political Parties in Iran - into Professional Association groups according to their profession. Organize nationwide General Strikes in Iran, specially those working in Transportation, Petroleum and Electricity nationwide grid. To completely paralyze, by their wide spread Strikes, these foreign puppet mullahs illegitimate regime and their organized crime mafia groups that have occupied Iran today. Last edited by Surenareal on Tue Dec 26, 2017 12:27 pm, edited 2 times in total. Did you know that the largest branch-office of Mullah Ali Khamenei, after his office bunker in Tehran, is found near London, England, with more than a thousand personal working there. Area wise this office of Mullah Khamenei is larger than any other foreign countries Embassies in London. Source Iran International tv. Also, it should be mentioned here that the title Mullah is better understood by English speaking readers than "Akhond". Since Persians literature in the past has produced the legends of "Mullah Nasrodean" to define mullahs and show their deceptive, and charlatan nature of Mullahs as a group. We should call all those regime-mullahs, that have other fake-titles such as; ayatollah, hojatol ... .simply as "Mullah", e.g. : Mullah Ali Khamenei, Mullah Hassan Rowhani, ....similar to Mullah Nasrodean. Last edited by Surenareal on Tue Dec 26, 2017 12:26 pm, edited 1 time in total. Terrorist Regime of Iran is the benefactor for every single Muslim Terrorist Group in Middle East and Beyond. IRI Islamist Regime Got to Go!